Meierovitch * Meierov * Myerowitz * Meyers genealogical tree, click to enlarge. According to my aun Nelly, Baske Meierov/Meierovitch had two brothers (Faivke and Yankel) and a sister (Golda) He married Dinamirelle Rozemblat, daughter of Faivke and Nechamah. Of Nechamah's siblings, she remembers the names of Max, Abram, Leipke and Motke. 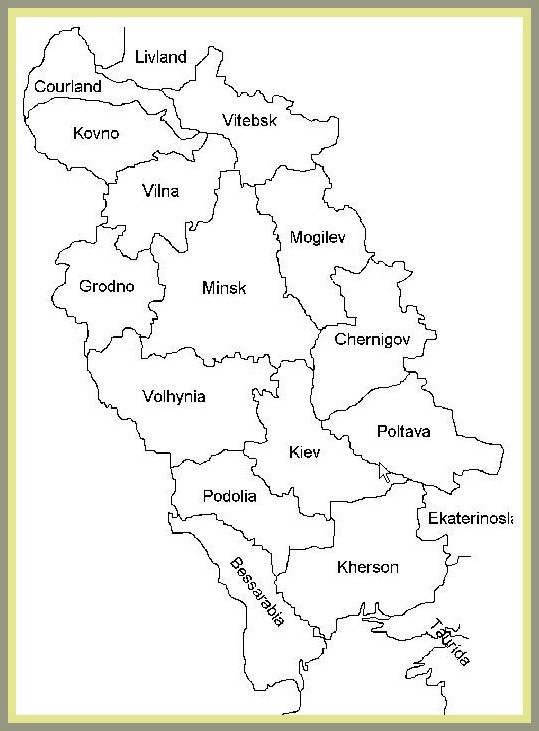 Consisting of a vast swathe of territory, the Pale included much of present-day Lithuania, Belarus, Poland, Ukraine and parts of western Russia. In 1809 the Russian Government ordered all Jews to adopt fixed, inheritable family names so that they might be more easily identified for taxation and conscription. In 1827, Czar Nicholas I decreed that Jews, who had heretofore been exempt from military service were now liable for up to 25 years of army services as common soldiers. As late as the middle of the 19th century, Russian Government officials complained about the frequent change of family names among Russian Jews who lived in different communities under different surnames. Jews were forced to live in the poor conditions of the Pale, and were discriminated against; they paid double taxes, were forbidden to lease land, run taverns or receive higher education. A liberalization period in the 1860s, which granted Jews some privileges, was reversed under the May Laws of 1882. These laws restricted Jews in the Pale to urban areas, which were often overcrowded and offered limited economic opportunities. In addition thousands of Jews fell victim to devastating pogroms in the 1870s and 1880s. The pogroms, boycotts and other anti-Semitic depredations Jews faced in the Pale led to mass immigration to the United States (two million between 1881 and 1914) as well as a string of other developments. Max Myerowitz came from Minks (actually Belarus). He was a brother or cousin of Nechamah Meirerov(note the different spelling). He migrated to Canada and the descendants changed the surname to Meyers. Most probably he was the one that claimed his niece Sarah (his sister Nechamah's daughter?) as she was the first one of the Shuster's siblings to migrate. Today most of them live in Winnipeg and in some way or another we are related. Some time ago, I requested Cousin Marvin, to contact any one of the Meyers' cousins who live in Winnipeg like him. He did so, and on the 29th of February 2004, he met with George Meyers (one of Max's sons). He informed Marvin, that his father Max came from Minsk, Russia. Their name was originally Meirovich; however because it had a Slavic connotation, to which the family objected, they eventually adopted Meyerowitz. His brother Sam (age 92 and alive at that time) was apparently more knowledgeable regarding that facts, but unfortunately at that moment he was currently in hospital. George further informed Marvin, that he had somewhere, old photos with names of family members and promised he would try to find them. I am hoping that on reading this site, some of them will be interested in the genealogical project and will check old trunks for records, documents or old pictures that will help me to find the possible city my great-grandmother Nechamah was born. I am sure, Cousin Marvin will be willing to scan any old picture or document they may have. Maybe someone of the new generations will be able to take the genealogy torch? Max Myerowitz genealogical tree, click to enlarge.